Toes sinking into warm white sand, waves gently lapping at the shore and a sun that fills you up with warm happy vibes – not to mention all those delicious rum punches. Yes, Antigua has a lot to offer for anyone who wants to fly and flop onto one of its 365 beaches. But what about when you’re bored of the beach or have had your fill of chill? It may be a small Caribbean island but there are plenty of cool and unusual things to do in Antigua. 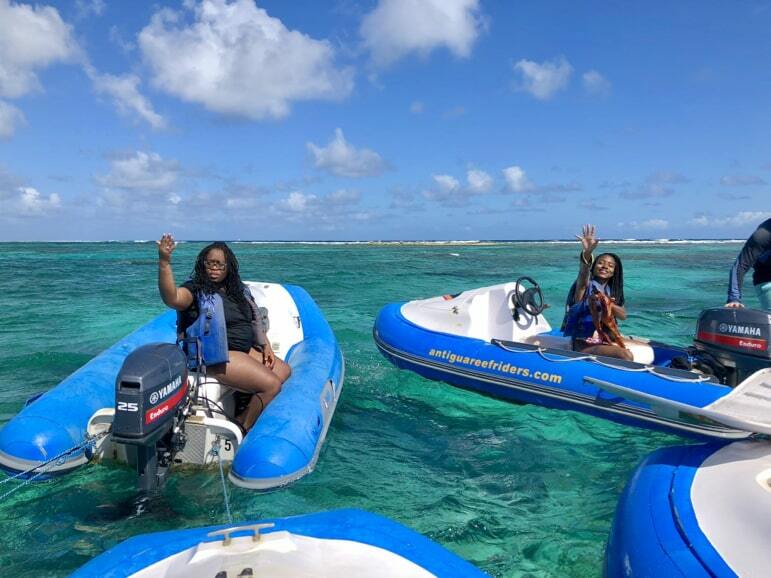 As we discovered on a recent trip it’s full of exciting island adventures, natural encounters, great food and even some activities that took us by surprise. 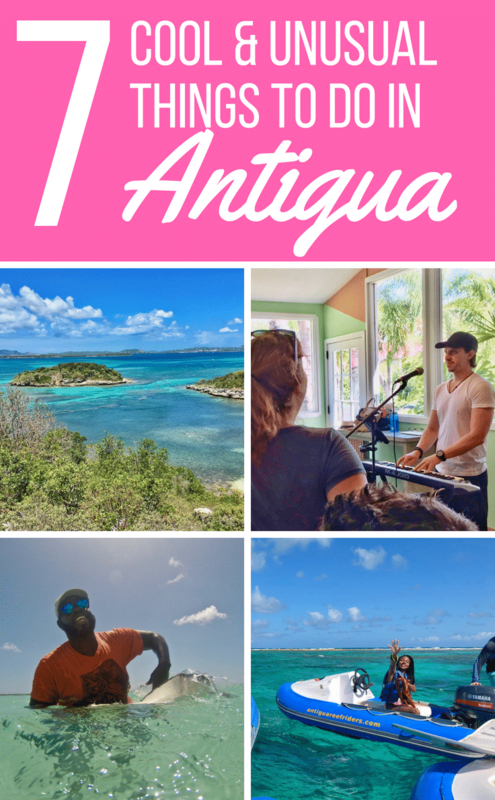 To help you decide what to do in Antigua, here are seven of our favourite things we did while on the island. We’ve also included information on the best time to visit Antigua, how to get there and luxury hotels for you to consider. Antigua Tourism boasts that the beach is just the beginning of the island’s attractions. Marketing slogans aside, the number and sheer variety of activities we managed to fit into our week-long stay certainly surprised us. 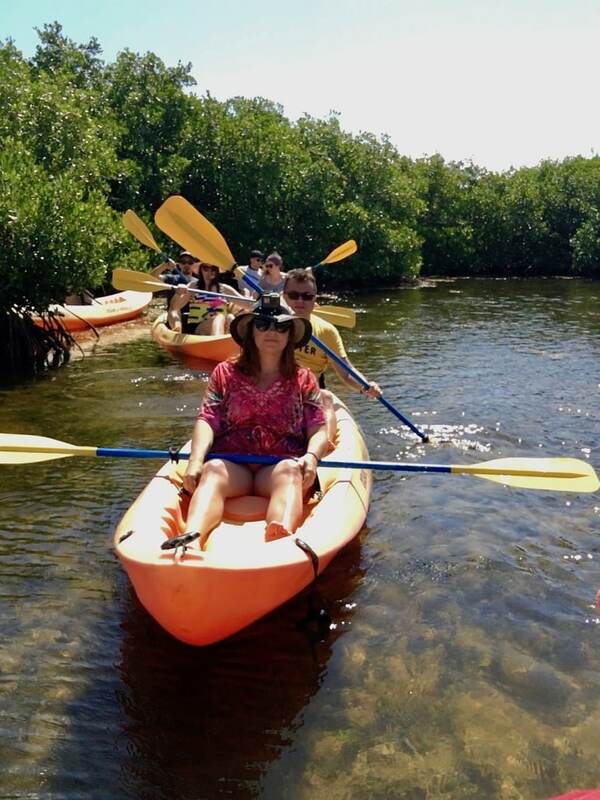 I love a bit of kayaking, so I couldn’t wait for my day out taking in the mangrove forest at North Sound Marine Park. 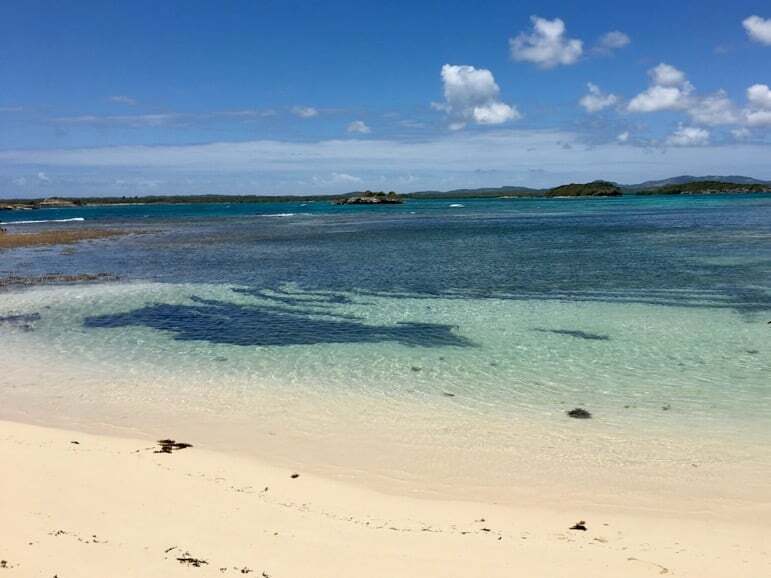 I had signed up for a kayaking, snorkelling and Bird Island tour run by Antigua Nature Tours. 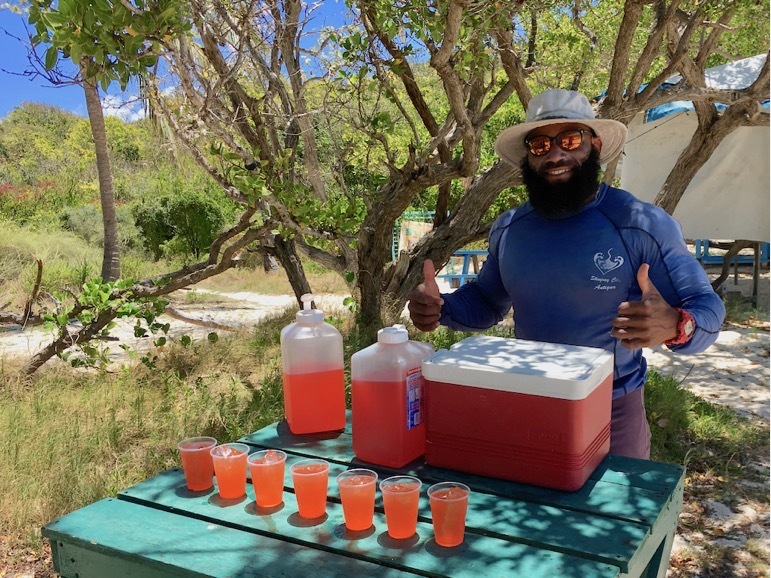 After a 30 minute transfer from where I was staying the Pineapple Beach Club, we were greeted by ebullient Captain Hercules (his real name is Adrian), ready to start our adventure. After speeding out to a dock near the mangroves, we transferred to our two-person kayaks. My friend Nellie and I shared a kayak for the first time in eight years and we were delighted to be back together exploring again. Captain Hercules told us about the red mangroves’ vital role in maintaining the delicate environment. They have the ability to withstand hurricanes, sea storms and flooding, and so protect the shore from erosion. 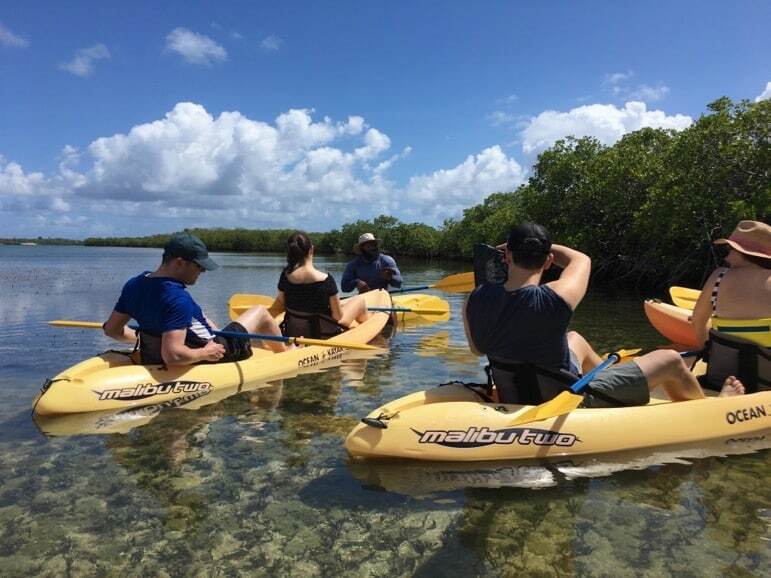 We saw a variety of birdlife, sea cucumbers, crabs and jellyfish as Hercules told us of the great biodiversity of the mangrove ecosystem. The kayaking tour was taken at a gentle pace, was not physically strenuous and so is suitable for all age groups. It was an idyllic morning but all too soon we were pulling our kayaks to the dock and hopping into a speedboat again. Thankfully though, the tour was far from over. We were on our way to Bird Island about three kilometres off Antigua’s northeastern coast. 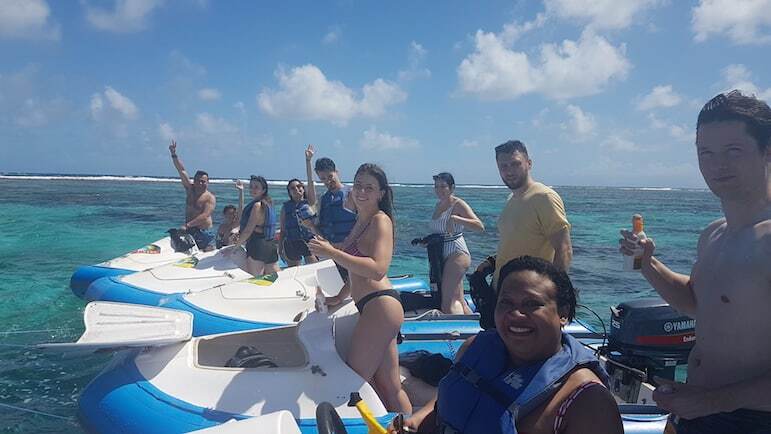 Jumping out of the boat we took to the warm, clear and calm waters to snorkel on the coral reef. There was something strangely hypnotic for me about watching the array of colourful fish life darting to and fro across the reef. I always find witnessing this aquatic scene – something that has gone on every day for thousands of years – rather humbling. There is little like being up close and personal to nature. Back in the boat and it was on to our next stop – Bird Island itself where we were handed a very welcome rum punch as we came ashore. The white sandy beaches were deserted except for the dozen of us visitors from the boat. However, rather than rest on the welcoming sands, I headed up the rugged, stony hillside to search out views over the island and further out to sea. It was well worth the climb. Arriving at the crest of the hill, I looked out at a variety of blues as the calm Caribbean Sea dazzled in the midday sun. 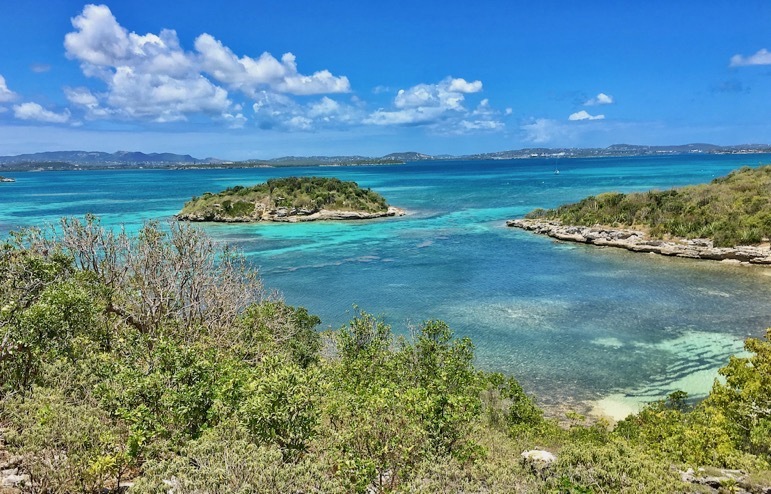 Rum is synonymous with the Caribbean, so when I was invited to cook with it I jumped at the chance and also discovered one of the best things to do in Antigua. Well, who doesn’t like rum? Nicole’s Table is where all the action happens. 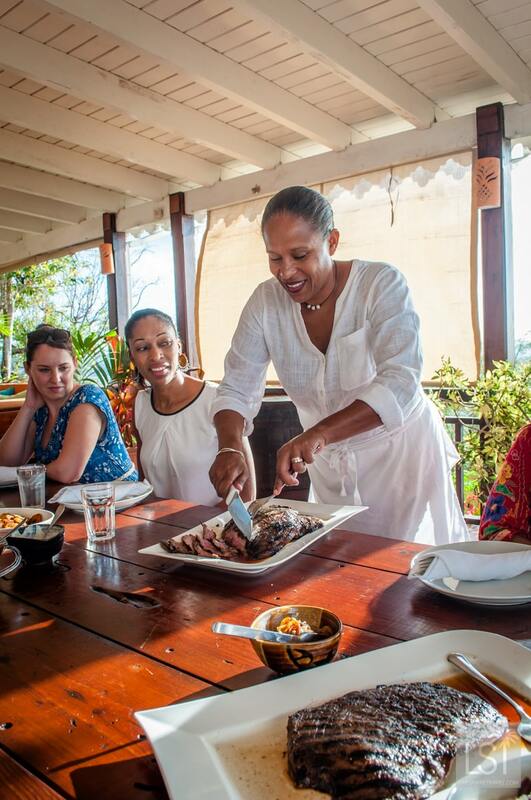 Cooking lessons occur in the beautiful home of chef Nicole Dennis, with the added bonus that from her enormous veranda there are magnificent views out over the Caribbean Sea. Nicole and her Guyanese assistant Connie were very welcoming and knowledgeable. The atmosphere was relaxed, friendly and very homely. 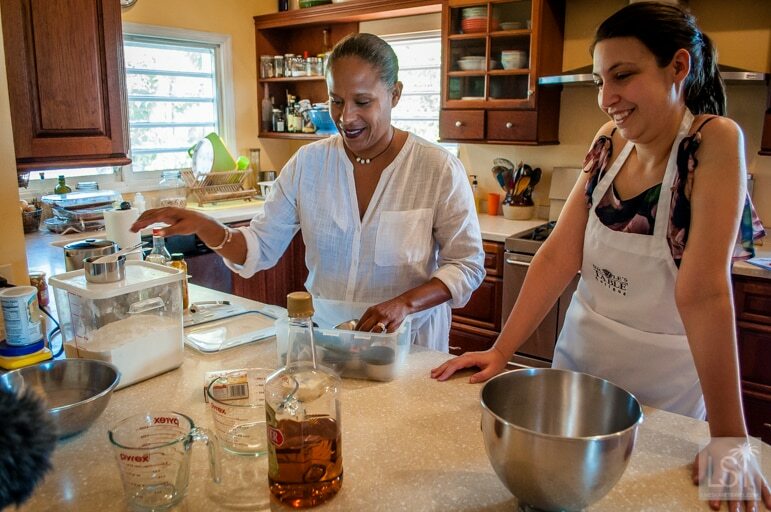 Cooking with rum was just one of the many exotic classes available that explore a range of Caribbean flavours. Starter: Sweet potato soup (with rum). Main course: Rum and brown sugar marinated flank steak with onion jam, plantain, red beans and rice, and garden salad. Yes, rum ran through each delicious, alcohol-infused course. Each of us pitched in with different aspects of the preparation and cooking process. Even though I don’t eat meat I marinated the flank steak, and I think my carnivorous colleagues appreciated my contribution. 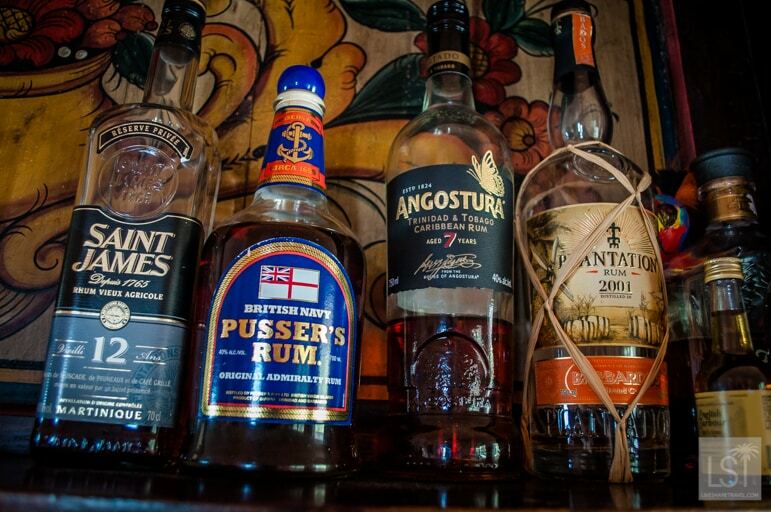 While we awaited the food to finish cooking, Nicole’s husband, Adam, gave us a really interesting and comprehensive talk on rum, its history, the vast variety of rums available and its cultural importance to the whole Caribbean. 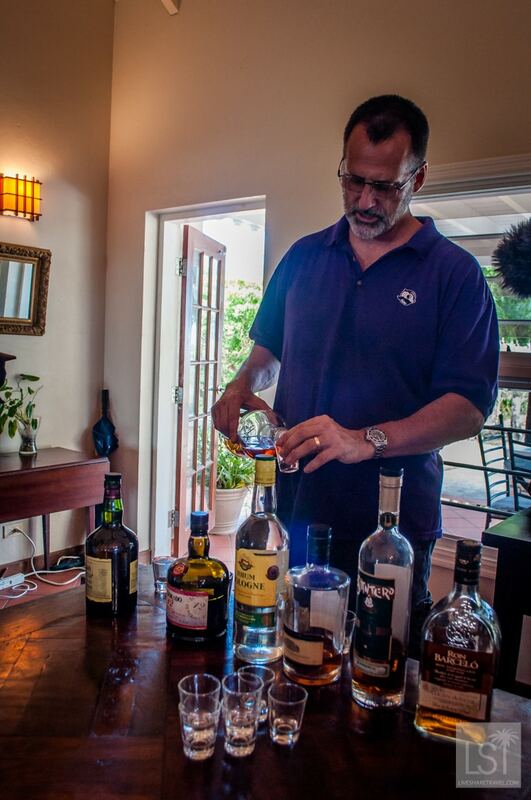 I learned a lot – for one, I never realised it was slaves that started making rum. Adam’s lesson was fascinating, but the added bonus was that we tried a variety of rums while he explained their background and significance. When the meal was ready we filed out to the huge dining table on the veranda to savour our hard work. 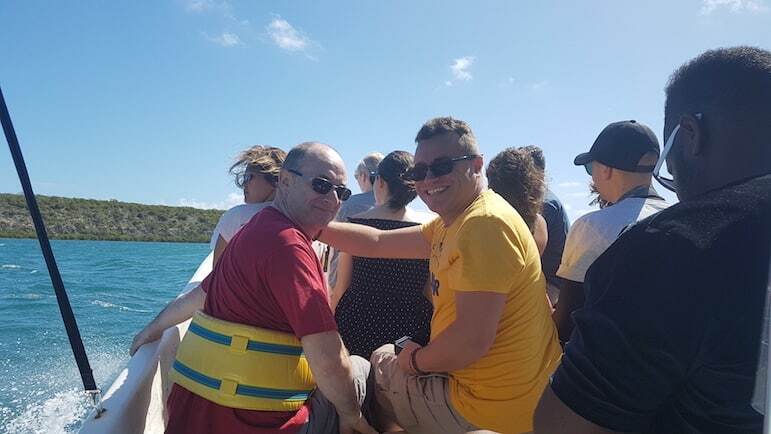 With a sense of accomplishment, we relished the occasion as we gazed onto glorious views of the Caribbean Sea. Hanging out with stingrays may not seem the wisest encounter, especially after we heard of their potentially dangerous side and the sad death of one of the world’s most famous conservationists. It did sound, writes Sarah, like an invitation to swim with anacondas at first. But I was reassured by photos on the Stingray City website and encouraged by a friend who’d recently been on the trip while on a luxury holiday in Antigua. After a briefing and safety warnings before the trip out to meet the Antiguan locals, I felt happier still. Our guide explained that southern stingrays are friendly creatures and very rarely attack humans, and then only if they felt very threatened. So after a short speedboat journey, we were out on a platoon near a shallow reef. Stepping into clear water up to my waist, it wasn’t long before a stingray went shooting past, wings gently flapping as though it were a bird coasting through the sky. At first I was nervous. But the rays weren’t. They swam close enough to touch us, even squeezing through quite narrow gaps in our legs where some of us stopped to talk or put snorkels on. And squeeze some of them did as the females, in particular, can grow up to six-and-a-half feet long in the seas off Antigua. But when they brushed past it was with a softness you wouldn’t expect of a fish, but perhaps from the well-moisturised skin of a baby. I was still twitchy though, yelping each time one of them came close. Seeing our guides leading others in the group to hold a stingray, I thought I’d give that a go – become more acquainted and get over my nervousness. Stingray City Antigua which organises the trips encourage the wild rays near with food offerings, but the animals are of course free to swim away at any point. They are also passionate about the animals and even have names for their favourites, like Fluffy – so called because of the cloud-like feel of his skin. Holding a stingray requires you to be really supportive, placing strong, but relaxed, arms under its body, being sure you allow plenty of room for its sucker-like mouth underneath. 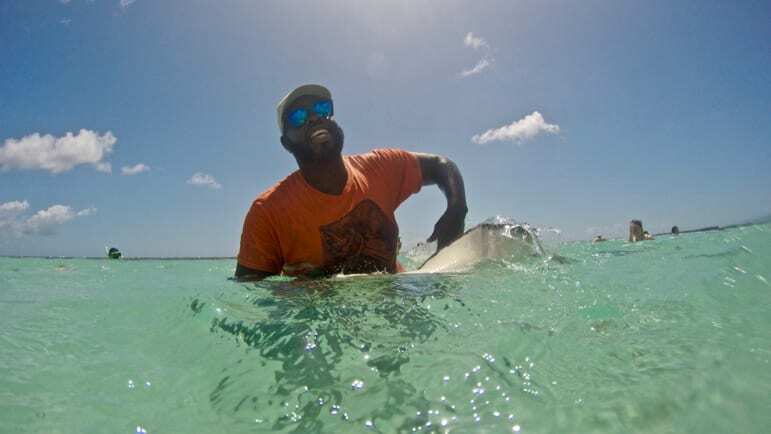 You get very close and personal as though giving it a hug, and I found the rays were very relaxed with us. 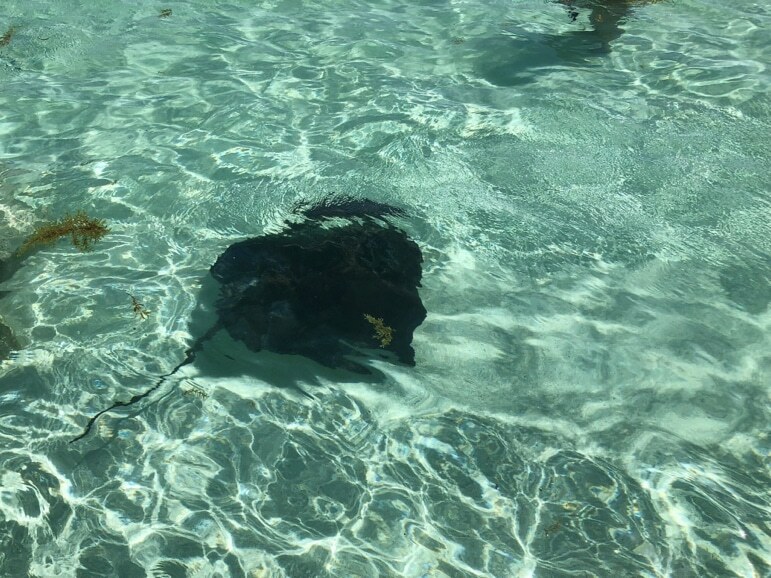 This helped me to not only find a moment of Caribbean chill with the stingrays but to fall in love with these graceful creatures. Before we left for the Caribbean we heard about the launch of a very exciting new Antigua attraction. 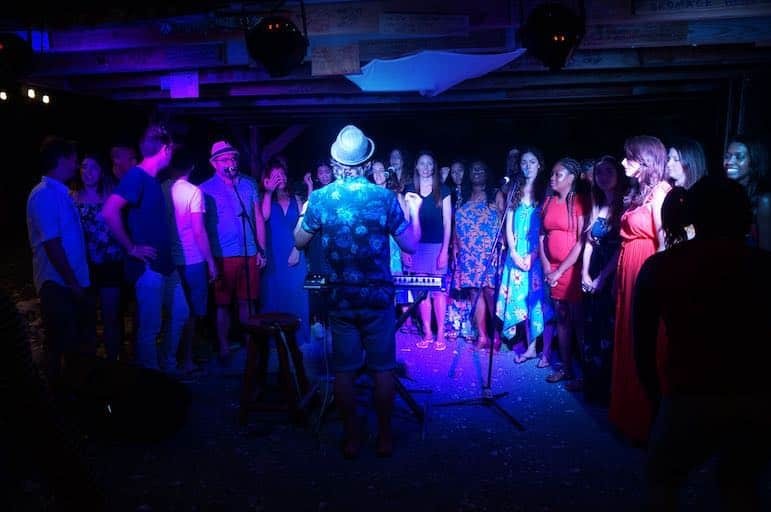 The Caribbean Choir is a free singing workshop organised by Elite Island Resorts in Antigua and also Barbados. Sarah loves a bit of singing and couldn’t sign up quickly enough. While I have a voice that that would make your ears bleed, so it was a big fat “no” from me. However, as more of our group signed up, I went along to see what the fuss was all about and ended up joining in. And I’m so glad I did. 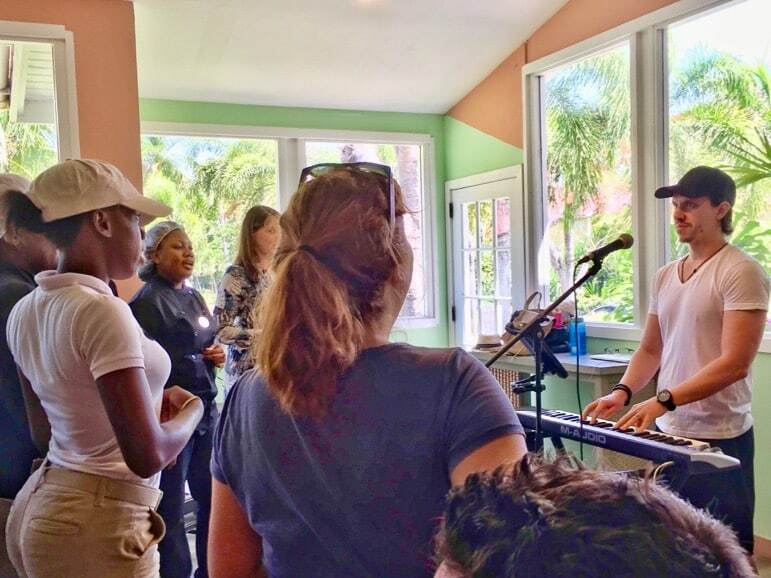 Along with 25 of our group and three members of staff from the hotel we formed a choir and began a truly transformational experience. Professional vocal coach Mike King and his lovely wife Carol were the maestros responsible for turning our rabble, which I affectionally entitled ‘No Direction’, into a choir capable of performing live in only four days. Despite my initial reluctance, I committed wholeheartedly to the breathing and vocal exercises and began to really enjoy the experience. After only three two-hour sessions we were ready to perform four songs live before an invited audience – classics Let’s Stay Together, Many Rivers to Cross, and Higher and Higher, plus modern ballad, Stay by Rihanna. There are many great things to do in Antigua, but for both of us, singing in the choir was the highlight of each day. 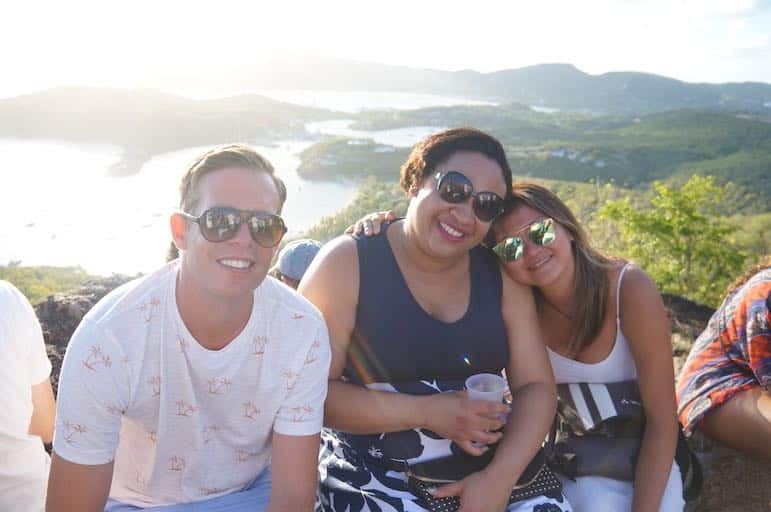 In fact, it was the highlight of the whole week, giving us something truly special to take away from the Antigua holiday experience. I must admit I had never heard of Shirley Heights before visiting Antigua. However, now that I been there, it more than justifies its reputation as one of the major Antigua points of interest. It arguably has the most outstanding views on the island and is surely one of best places to visit in Antigua on a Sunday evening. A restored military complex, set within a national park at almost 500 feet, Shirley Heights overlooks the beautiful English and Falmouth Harbours. We arrived there early with the sun shining brightly in a blue sky filled with just enough puffs of cloud to ensure the sunset would be interesting. Later, as the sun began to set, the shimmering landscape of the English and Falmouth Harbours took on a kaleidoscope of colour, and we were enthralled by the views. Besides the glorious views, it turns out that Sunday night is party night at Shirley Heights. For the past 31 years, people have converged there to see the sunset then dance the night away to the irresistible sounds of a steel band. There’s also plenty of delicious Caribbean food, and of course, rum flowing into the night. From 4pm to 10pm this the place to be on a Sunday. I’m not an adventurous sort, writes Sarah, so when I decided to not only take a seven-mile ride out to sea on a tiny speedboat but man the boat myself, I thought I must have taken leave of my senses. However, working on the basis of YOLO (you only live once, for anyone who’s not a trendy millennial) I jumped straight into the peppermint hues of the Caribbean Sea with Antigua Reef Riders. I wasn’t alone in my boat but accompanied by the far more adventurous Paul, who foolishly agreed to me taking the wheel. I thought I’d be rather Driving Ms Daisy about it – pootling at the speed of an octogenarian. But not only did our tour leaders warn against this as we’d be bounced around once we hit choppier currents, it also wasn’t long before I found my inner speed demon. In fact, there came a point where try as I might, I couldn’t get the boat to go any faster. Clearing some choppy currents we were soon out in calmer seas and at one of the most spectacular Antigua points of interest, Cade’s Reef. The sea there was pretty clear, even if visibility wasn’t at its best that day. But stronger swimmers than me could swim out to shallower water above the reef with greater visibility and more sea life. All too soon we were bouncing our way back across the sea to the marina. Though not without stopping first to race each other across the sea – the blue of the ocean and the sky merging as we careered around like crazed children on too much sugar. Doughnuting, turning, we sped through the Caribbean blue to peels of laughter. 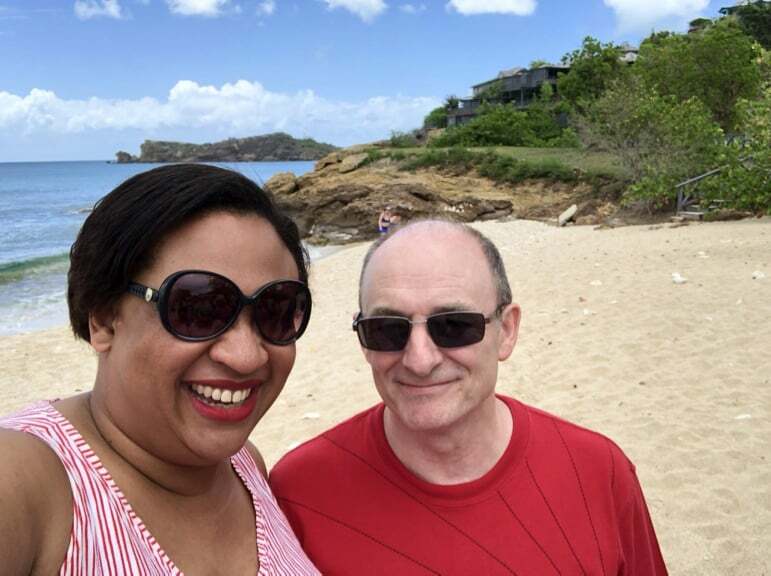 We stayed at and visited four all-inclusive resorts during our time in Antigua, they all offered a great experience, however, the most luxurious, Galley Bay Resort & Spa was our favourite. Pineapple Beach Club – set in a quiet location, with a very good beach, plenty of things to do and stand out restaurant Pineapple Grill. 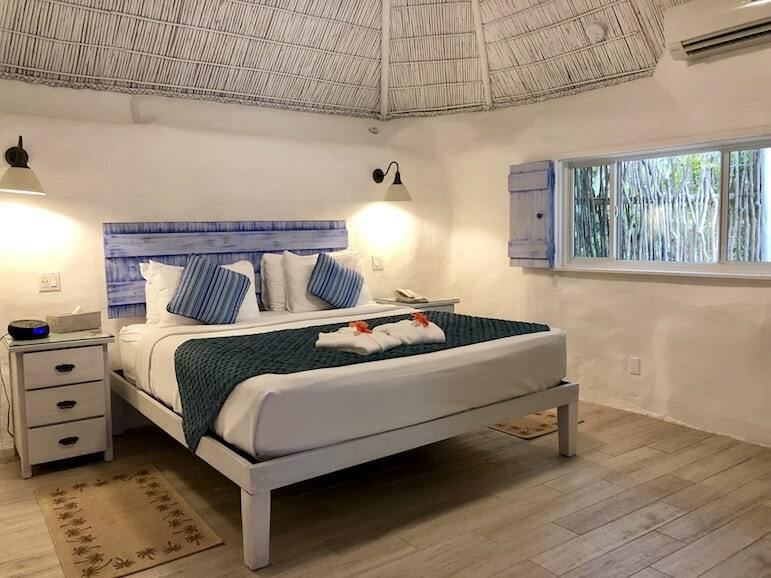 Verandah Resort and Spa – very good accommodation, spread over a large area with clifftop views of the coast from across the resort. St James Club And Villas – luxurious with a good selection of restaurants, the beach was clean and large with plenty of activities including FitFloat. Galley Bay Resort & Spa – is quite an intimate but relaxing hotel, with a beautiful beach and great spa. 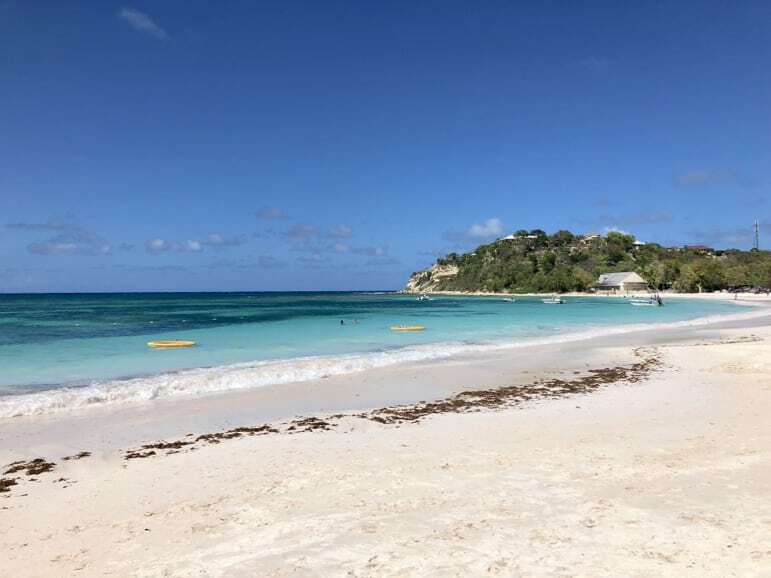 There’s no bad time to go to the Caribbean, but the best time to visit Antigua is between May and November as long as you’re prepared to put up with the occasional tropical shower. We visited in May and only had one day which was a bit on the cloudy side, but it was still very warm and after a good rain shower it brightened. 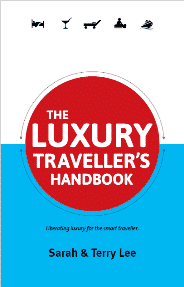 Accommodation is also more affordable and the beaches less crowded. However, buyer beware – this time of year is officially hurricane season. December to March is high season in Antigua when it’s busier and heavier on the pocket. Virgin Atlantic has flights to Antigua from London Gatwick three times a week. Meanwhile, British Airways have a daily service of flights to Antigua from London Gatwick airport to V.C. Bird International Airport, in the island’s capital, St. John’s. We have flown with both airlines countless times, but this time we travelled with Virgin and have to credit the crew for a fantastic flight. We always find them hospitable and brilliant fun. The flight time to Antigua is approximately eight hours. Have you been to Antigua before? What would have made your list of favourite experiences? Tell us about your trip in the comments section or fire away with your Antigua questions. This is great! I have always wondered if the countries in the Caribbean would have enough to keep me busy and you have proven that Antigua does! Hi Jade, for a small island, Antigua punches above its weight. In terms of things to do it will certainly keep you busy or you can just crash on the beach. What a gorgeous destination!! I haven’t been to Antigua but doubtless that will be a destination on my bucket list! I loved Antigua, I stood at sandals. While there are 365 gorgeous beaches. We ferried over to Monserrat. We toured the volcano. Half of the island is buried under volcanic ash. You must see this.